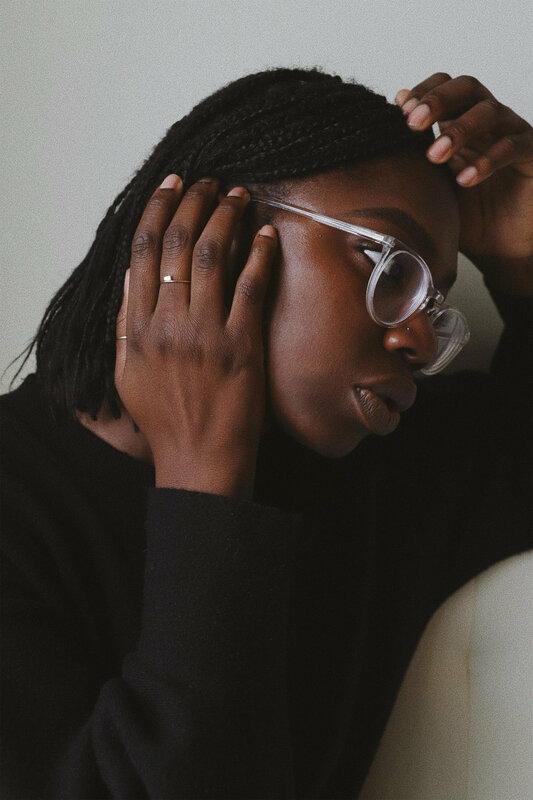 Jessica Egbu created her fashion blog, The Oxfordist, as a place for personal expression and to document her love of fashion. Named as a reference to her large collection of oxford shoes, birth country, and the writerly dilemma and debate of the Oxford comma, The Oxfordist began as a passion project, but has evolved into a vehicle that has afforded her opportunities both personal and professional. In short, she's living her dream. Jessica is very much an example of what can happen when you dedicate yourself to creating space for your voice and then commit to the work and personal inquiry necessary to unearth your inimitable genius and give form to your inherent gifts. She’s an inspiring force of honesty and authenticity, silliness and positivity, and we couldn’t be more excited to have her as a part of the Holisticism family. A yummy salad with salmon/avocado! I also really really love French cuisine. This question is really hard to answer. Podcast: The Read by Kid Fury & Crissle. It’s just a podcast for black people, by black people. I feel comfortable when I listen to their commentary on social issues, pop culture, black excellence, etc. It just feels like you’re talking/listening to your best friend. Magazine: I’ve always been a fan of Porter Magazine (by Net-a-Porter)! It launched around the time I was starting my first real job so it’s been a source of inspiration for me as a working woman in the city. Movie: Honestly anything with Saoirse Ronan. I think she’s incredible! Song: You Gotta Be by Des'ree. Not only is it nostalgic to listening to this song on the radio as a kid but the message is thoughtful! Where in your life can you do less? Where can you do more? I definitely could be more active in my community, especially for black people. That’s something I plan on doing during the summer. I think it’s really important to walk the walk if you talk the talk. Spirituality is also important to me. It’s really easy to fall into the trap of blaming yourself of not achieving your goals outside of work on “being busy”. I also would love to focus on my health a little more. I’m a huge supplement taker, but definitely being more active and participating on more mini day trips over the weekend is something I need to do more. How do you practice Self Respect? Still trying to figure that out, to be honest, but ultimately just reminding myself daily of my worth. Of who I am, and who I’m supposed to be in this life. What brings you joy + pleasure? Doing things that don’t require a deadline, haha! Don’t get me wrong, my work definitely brings me joy + pleasure, but as most can relate it’s a different type of j+p. When I think of joy + pleasure, I think of casually cooking dinner with my partner, hanging out with friends, giving myself a slow + steady skincare treatment, binge-watching Living Single for the umpteenth time, calling my mum and laughing about what hilarious thing my little sister did this week. Essentially things that allow me to switch off my work brain. How do we make wellness more accessible to more people right now? Right now in the age of Instagram, wellness is really accessible to the middle/upper class. We need to come together and bring wellness to those who can’t afford a monthly subscription to super chic vitamins OR have space in their life for an hour of yoga OR to go online and buy a dry brush. Normalizing self-care and wellness in our communities are one of the ways we can make taking care of yourself more accessible to people. More conversation from different types of people, especially those communities whose populations are suffering from staggering statistics around failing and chronic health issues. Similar to living a more eco-friendly life, education is key to normalization accessibility — making it part of the vernacular. However, it ultimately starts with fixing the ridiculous health care system in America. How does your background influence your perspective and life today? My mother and father are Nigerian, from the Yoruba tribe, and that infused their household in a very strong way. I love being Nigerian and knowing where I am rooted in Nigeria, but I grew up in the UK and came to the US as a pre-teen. Coming here like other black kids and didn’t carry in me all the history they did, yet I tried to blend in for a while and am still navigating what it means. Besides that, I’m highly influenced by music because my parents are so musical. I grew up listening to an eclectic collection of music from all genres and parts of the world. My parents also took my interests seriously and started helping to hone my creativity from a young age, they saw the value of my hobbies as a part of my future and from an early age helped me build skills that allowed those interests to later become a career. Where in your wellness journey are you looking to grow? I look to my parents as spiritual guides, and continuing to develop my own spirituality is really important to me. I’m also in a place where I want to take time to love the person I am AND want to be. It’s hard to be a tall, dark-skinned woman in SF and I’m in a constant state of comparison with others around me. I want to be self-accepting no matter what and to not be judgemental or hurtful towards others because of my own insecurities. I want to take my authenticity to the next level, and truly rep myself in the best possible light at all times. It’s a forever journey…. Do you have a defining moment that initiated you on a journey of wellness and personal growth? In 2015 my father was diagnosed with prostate cancer which was a huge wakeup call for myself and the entire family. He is healthy and well now, but it stuck with us all and pushed us to be more active, healthy, and thoughtful. For me, I’m the oldest of my siblings so I had the realization that if anything was to happen to my parents I needed and wanted to be in a position where I could take on additional responsibilities if needed. I started taking better care of myself and was more conscientious about my life. How does Instagram influence your creative process? It is a great creative space because no one does just one thing, and I’m [digitally] surrounding by people I aspired to emulate. By seeing all this creativity and production, it has pushed me to continually explore my own personal expression and clearly define what is coming from within versus what is coming from influences. How has your digital persona evolved over time? Transparency and authenticity are key — people are over the fabrication of perfect lives on Instagram. In the early days and as I developed my voice, I highly curated my persona on The Oxfordist and was hyper aware of wanting to be recognized as a cool, reputable voice in the fashion space. Now that I feel more secure in myself and contribution, I’m comfortable showing more of my real life and it turns out that people want to see that also. Getting a matcha, making political statements, the reality of my day to day is something that my community also finds interesting. Through this I get to now show more of myself, be funnier and sillier, my everyday self is blending into my “Oxfordist” self. My motivation has changed as well, I’ve become this persona of a girl in fashion who loves fashion because it’s her creative outlets for self-expression but at the same time knows it doesn’t “matter” in the weighty, worldly send of the word. I don’t take myself too seriously. What’s it like working in fashion in SF? Weird! It’s a love child between NY + LA, we have the nature that is so unique to California but we are all crammed into this super small 7x7 mile urban center. We have the super zen thing right alongside the hustle and bustle of city life fueled by motivated, driven people. On the fashion side, some years it’s mediocre and some years it’s really amazing. Silicon Valley influences all we do here, and that includes where fashion is headed and we see that influence on the front lines here. Professionally, jobs in the fashion industry are fewer so once you get one most are inclined to stay in their role, where in other cities there is a lot of fluidity and endless opportunity. The element of isolation in SF, being a smaller fashion community and less on people's minds culturally, pushes me to express myself most authentically because I have to consistently check in to make sure I’m being true to my creative self-expression. 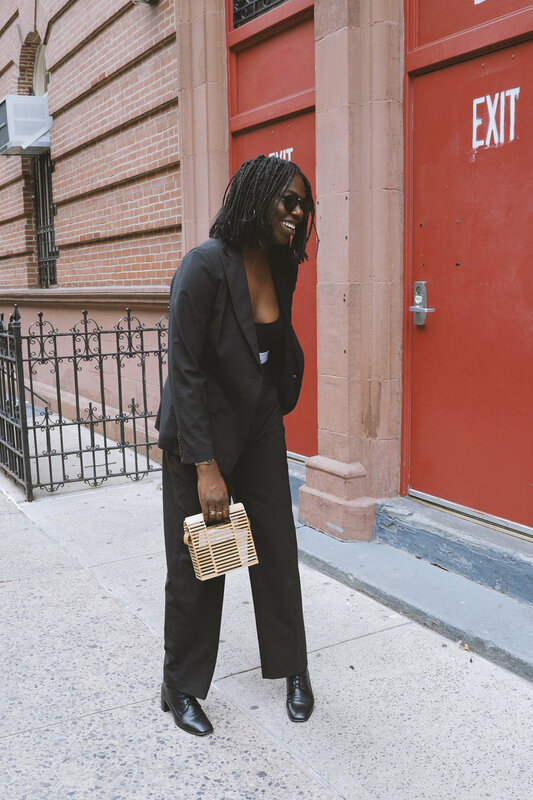 I stick out here — I’m a tall black woman with glasses — and I want to embrace that rather than sliding into something that isn’t a full expression of myself because of my surroundings. Being in SF has been a forcing function to commit to my self-expression through fashion and also hone in and define what that. What is interesting to you right now? I’m fascinated by studies on why we look the way we do, and how our surroundings and environment shape us into who we are. Psychology and what makes people who they are internally as well. The documentary “Three Identical Strangers” has sent me down a rabbit hole I could stay in for a long time. AND anything skincare related — I have good skin and want to maintain it and the more attention I pay to my skin the more I’m able to understand it and how it changes and reacts (food, sleep, stress, sun, etc). I have a 10 step morning and night routine that includes double cleansing, mini mask, toner, serum, acid serum, eye cream, facial oil, and sunscreen usual all while catching up on Wendy Williams or the news or with friends or my boyfriend. What do you want people to take away after crossing your path? I always get asked “how I did it” — get a great job in retail and fashion. I give all credit to the work I did on my blog and the creativity and work I put forth there. I started off wanting to have a platform to express myself, and it turned into a platform for connection and organic promotion of myself and creativity. And having persistence, talking to the right people, and always, always being interested in what I was working on because that is the only way good work is going to come through.